The Knersvlakte region is situated in the north west corner of the Western Cape Province. It consists of a hilly terrain covered with quartz gravel and is very rich in unique dwarf succulents only found here. It is recognized as a centre of plant endemism. The vegetation is Succulent Karoo is dominated by leaf succulents (Mesembryanthemaceae, Crassulaceae) and shrubs spread amongst them. Many succulents are confined to the white quartz gravel, which reflects the sunlight, and is not as hot as the darker rocks and soil. Many of the succulents here are usually dwarf and compact – ideal to absorb thermal heat in the short cool winter growing season when rain occurs. The climate is semi-arid with long dry summers. The Knersvlakte region is also the southernmost distribution of the quiver tree (Aloe dichotoma). They are slow growing, flowering during winter. The San tribes (bushman) used their stems as quivers. Their racemes of yellow tubular flowers are pollinated by sunbirds. The quartz gravel and rocks in this part of the conservatory were kindly donated by Buys Wiese from the farm Quaggaskop in the centre of the Knersvlakte. The dominant vegetation displayed is mainly members of the Mesembryanthemaceae. 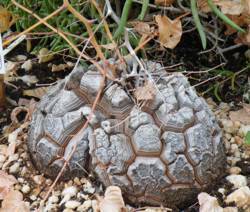 The bababoudjies (Argyroderma) are prominent dwarf compact plants resembling pebbles and have been planted throughout on the quartz gravel. Their silver- green or gray leaves reflect the sunlight. Argyroderma (argyros = silver and derma skin) have attractive purple or yellow flowers during the autumn and winter. Their fruiting capsules like all other members of the Mesembryanthemaceae are hygrochastical, only opening with moisture and the velocity of the raindrops on the wet capsule roofs, disperses the seed by water pressure almost like a water pistol. When the capsule dries out the lids close again, protecting the seed. The seed are thus only released during the rainy season. The rooivye (Stoeberia utilis) is the largest Mesemb growing here, usually confined to sandy patches especially common near the sea. Unlike other mesembs its capsules, after opening, remains open. It has seed which is wind dispersed. The stonecrop family (Crassulaceae) is also well represented here with the botterboom (Tylecodon paniculatus) the largest, flowering from late spring and early summer. It has reddish tubular flowers pollinated by sunbirds. The plant becomes deciduous during the summer months. The related krimpsiektebos (Tylecodon wallichii) has pointed stems and yellow flowers during summer. Adromischus maximus, the largest in the genus, resembling a pig’s ear (Cotyledon). Crassula macowanii is another shrubby species and Crassula brevifolia is widespread on outcrops. The aloe family is also represented here (Aloaceae). The sickle aloe (Aloe falcata) has rough sickle-shaped leaves. Its panicle of red tubular flowers is produced in summer. 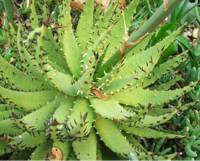 The black-thorn aloe or swartdoringaalywn (Aloe melanacantha) has dark blackish spines on its leaves. Aloe kamnelii is a rare endemic from just south of the Knersvlakte. The ox-tong (Gasteria pillansii) has mottled leaves in opposite rows. Its elongated racemes are produced during summer. The koekemakranka (Gethyllis namaquensis) is a bulbous plant, which becomes deciduous in summer. It has a snake like stem emerging from the ground with protruding linear leaves. The sweet smelling white to mauve flowers appear during December followed by fragrant edible fruit in autumn. Euphorbia schoenlandii has cactus-like stems, a rare species only found here. It has milky latex. The flowers are small and yellow and the female flowers later bear capsules which explosively releases their tine seed. Aroena (Quaqua mammillaris) belongs to the Oleander Family (Apocynaceae) and bears sharply pointed tubercled stems. Its foul smelling flowers attract flies and blue bottles which pollinates the flowers. The elephant’s foot (Dioscorea elephantipes) has also been introduced to the southern side of the bed. Note the succulent stem resembling the shell of a tortoise.